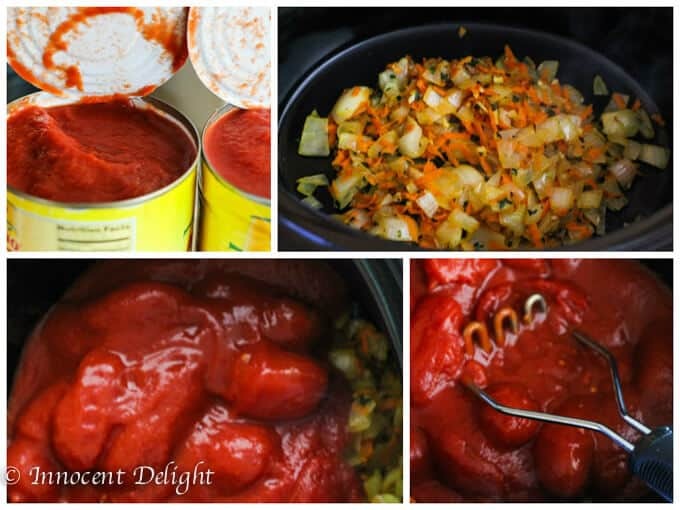 Easy Slow Cooker Tomato Sauce – doesn’t it sound ideal? Typically on my way to work I listen to Elvis Duran Morning Show on Z100. Recently they’ve been broadcasting a commercial for tomato sauce read by DJ Danielle. As weird as it sounds, this commercial inspired this recipe. She talks about the smell of the sauce in her grandma’s house; cooked for hours, without the addition of any water or sugar. This is atypical for prepackaged grocery store sauces, which are often packed with both water and sugar. I don’t know about you, but this isn’t exactly what I’d want to eat with pasta or meatballs. 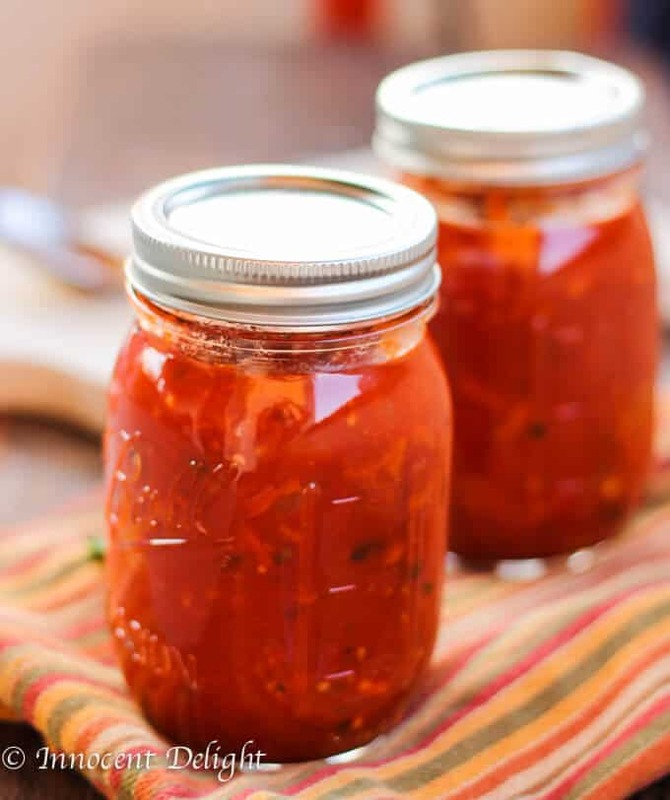 This Easy Slow Cooker Tomato Sauce is actually very easy to make. You just need to chop some onions, garlic and fresh thyme, shred a carrot, sauté it in olive oil for a few minutes, add it to the slow cooker, open 2 cans of good quality whole tomatoes, pour them on top of the onion garlic mixture, smash the tomatoes with potato masher (affiliate link) and you’re done. It doesn’t take more than 10 minutes to prepare. 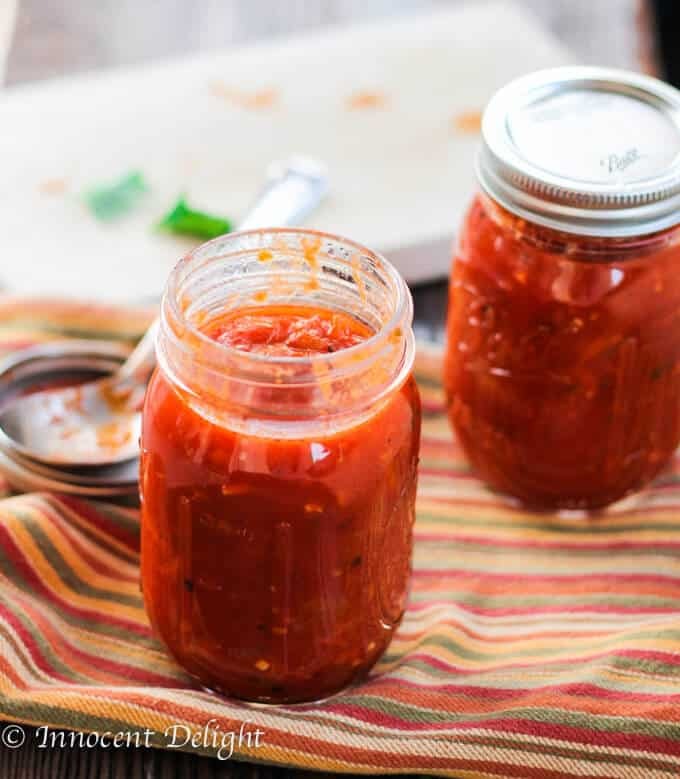 I used to make my sauce in a Dutch oven (affiliate link), but never for many hours. Listening to this commercial made me think that actually a slow cooker could serve this purpose beautifully, cooking for hours and making this sauce incredible thick and tasty. 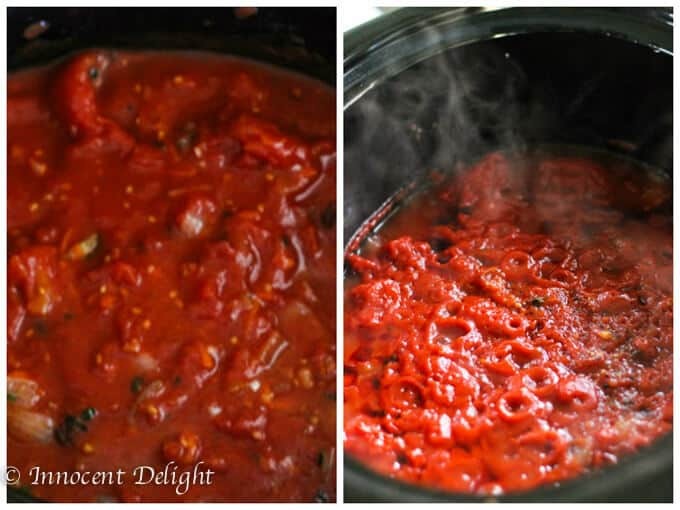 I decided to give it a try and let me tell you – I was not disappointed with this Easy Slow Cooker Tomato Sauce. The smell was mesmerizing and teased us for hours. I couldn’t wait for this sauce to be done so I could just dig in with the biggest spoon and indulge. You can use this sauce for many different dishes. It will work with pasta, with meatballs, on pizza, with mozzarella sticks, quesadilla, stuffed cabbage etc. 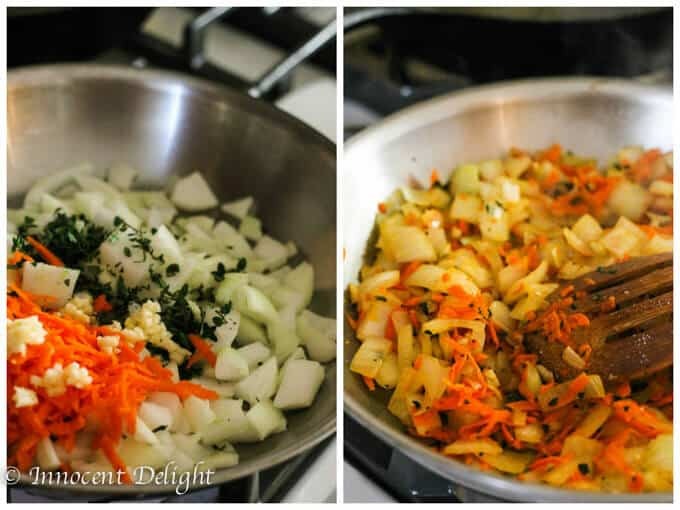 I actually made this sauce for a stuffed cabbage dish. Healthy Stuffed Cabbage with rice and good quality turkey meat will be a star of my next post (so be patient for that one). For this dish I actually pureed some of the sauce and added a dab of heavy cream for smooth and rich consistency. 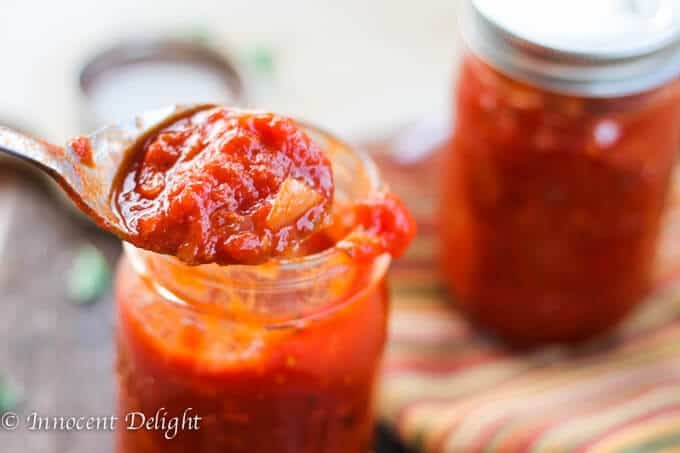 However, I decided to devote the entire post for this Easy Slow Cooker Tomato Sauce because I think it deserves its own space on Innocent Delight and because I think it is a versatile addition to several dishes. It is obviously delightful. After it's cooked, mix together and check salt and pepper amounts. 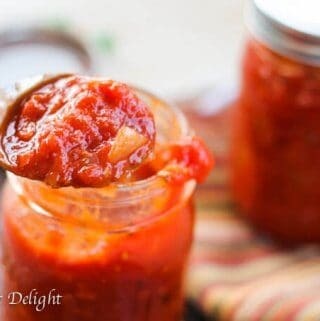 I have never made my own tomato sauce before.. let alone made it in a slow cooker! Definitely need to try out your recipe… this looks delicious and packed full of yummy flavour. Thanks so much Thalia. I hope you will like it. How much does this make, and what size jars are you using to store this in? Jennifer, thanks for checking my recipe. I got about four 16 oz. jars of sauce. Can you can this or freeze this for later use? If so how long would it last canned or frozen? Hi, just wondering how long can you keep this in the refrigerator? Hey Mary, this is a fresh sauce without any preservatives. I think it can be stored for about 4 days, after that you should probably freeze it. 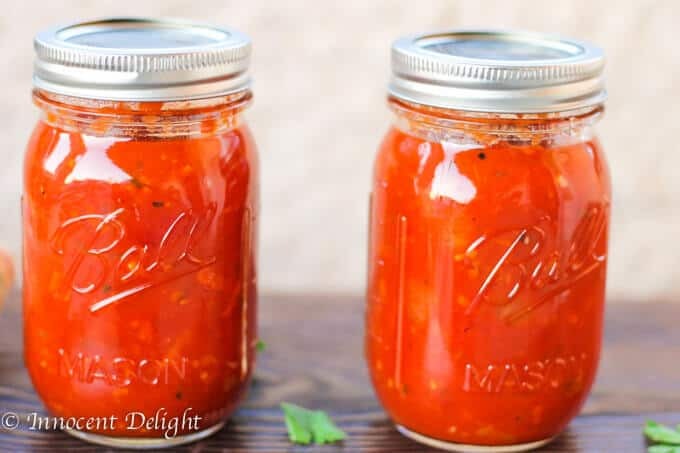 Can i make this with tomatoes from my garden? I would try. You should peel them though and remove seeds before putting to slow cooker. In order to peel tomatoes, boil some water, add tomatoes to it for a minute, take them out, let cool off slightly and peel the skin. Good luck.